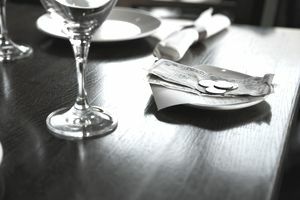 Employees who receive tip income are supposed to report tips of over $20 each month to their employer for tax purposes. Your employer should then calculate tax withholding on these amounts, just as taxes would be withheld on regular earnings. So what happens if you don't do that? You still have to report the income to the IRS on Form 4137. This form calculates the Social Security and Medicare Tax taxes you owe on your tips. As a practical matter, the IRS likes to be paid when you get paid, or not long thereafter. It imposes a "pay as you go" timetable even for self-employed individuals, and you could potentially end up having to pay a penalty on taxes you paid late because they weren't withheld by your employer—because you didn't report them. You must also file Form 4137 if any amount appears in box 8 on your W-2 statement for "Allocated Tips." Unfortunately, reporting and paying tax on allocated tips can create a significant tax bill. Your tips in excess of $20 should be reported to your employer by the 10th day of the following month. If you work for more than one employer, the $20 limit is calculated for each employer separately. If you earned $19 in tips from one job and $15 in tips from another job, you would not have to report your tips to either employer because neither amount exceeds $20. You don't have to report tips totaling less than $20 per month per employer on Form 4137 either. Here's how to go about filling out Form 4137. Line 1: List the company, or companies, to whom you didn't report tips in the spaces provided in this section, along with their employer ID numbers. You must also enter the total tips you received from each, including both reported and unreported. Line 3: Write in the total tips reported to your employer. This is found in box 7 of your W-2. Line 4: Subtract Line 3 from Line 2. These are the additional tips you must include in your wages on Form 1040 Line 7. These are also the additional tips on which you need to calculate your Social Security and Medicare taxes. Line 5: Total up all the cash tips that were less than $20 per month, and so you were not required to report them to your employer. Line 6: Subtract Line 5 from Line 4. These are the tips subject to Medicare tax. Enter this figure both on Line 6 and again on Line 2 of Schedule U, which is found at the bottom of Form 4137. Line 7: This line is already filled in with the Social Security wage limit of $127,200. You do not need to do anything here. Line 8: Add up all your wages reported on your W-2 statements in boxes 3 and 7, and your tier 1 railroad retirement benefits if you had any. These are the wages subject to Social Security tax. Put the total figure on Line 8. Line 9: Subtract Line 8 from Line 7. If the result is a negative number, that means the amount on Line 8 is over $127,200. If that is the case, put "-0-" (zero) on Line 9 and on Line 10. Line 10: Compare the figures on Line 6 and Line 9. Take the smaller of the two figures and report it on Line 10. These are the additional tips subject to Social Security tax. Put the same figure again on Line 1 of Schedule U. Line 11: Multiply Line 10 by 0.062. This is the Social Security tax of 6.2 percent. Line 12: Multiply Line 6 by 0.0145. This is the Medicare tax of 1.45 percent. Line 13: Add Lines 11 and 12 together. This is your additional Social Security and Medicare tax. You must also enter this figure on Line 59 of your Form 1040 tax return. Having allocated tips reported on your W-2 in box 8 is generally not in your best interest. Here's how to protect yourself. Take a look at your record of daily tips. If you don't have a record of daily tips, you need to get in the habit of keeping one. Your system doesn't have to be fancy. Just note your daily tips on a calendar, day planner, or in a little notebook. If you ever get audited on your tip income, you'll need evidence of what you actually received in tips. Add up the total amount of tips you received for the year. Did you report this amount to your employer? Look on your W-2. Does box 7 (Social Security tips) and box 8 (Allocated tips) add up to the same amount in your daily record? Are your allocated tips (box 8) more than, the same as, or less the total tips you recorded in your daily log? If your allocated tips are more than what's recorded in your daily log, you can use your daily log instead of the amount reported as allocated tips. If there are any additional unreported tips, use the amounts from your daily records to fill out Form 4137. But be prepared for lots of mail from the IRS and a tip audit. Keep your daily record of tips with your tax return so you're ready when the IRS auditor asks to see your records. If your allocated tips are the same as what's recorded in your daily log and you reported your tips to your employer, then it's likely that your employer reported this amount in the wrong place. Ask your employer if this amount should have been reported on box 7 (Social Security tips) instead of box 8 (Allocated tips). If your employer won't correct your W-2, just go ahead and fill out Form 4137 using the figure in box 8. If your allocated tips are less than what's recorded in your daily log and you reported your tips to your employer, something is probably wrong with your employer's recordkeeping system. You should report the allocated tips on Form 4137, plus any additional tips you show in your daily records, and ask your employer to correct your W-2. What if you have no records of your tip income? Ask your employer how he calculated your allocated tips amount. Ask to see computer records, daily or weekly sales reports, or other information that would show your sales and your tip income. If your employer refuses to share this information with you, you'll have to proceed very carefully and start keeping your own daily records to protect yourself. The IRS loves to conduct tip audits. If you have allocated tips and elect to not report the full amount on Form 4137, be prepared to explain how you calculated your tip income to the IRS. You'll most likely have to show your daily tip record as evidence. If your unreported tips are pretty substantial, the IRS may impose a penalty of 50 percent of the Social Security and Medicare tax that appears on line 13.